In the dance program, students shake, rattle, and roll; as they explore the freedom of movement and develop their kinesthetic sense. 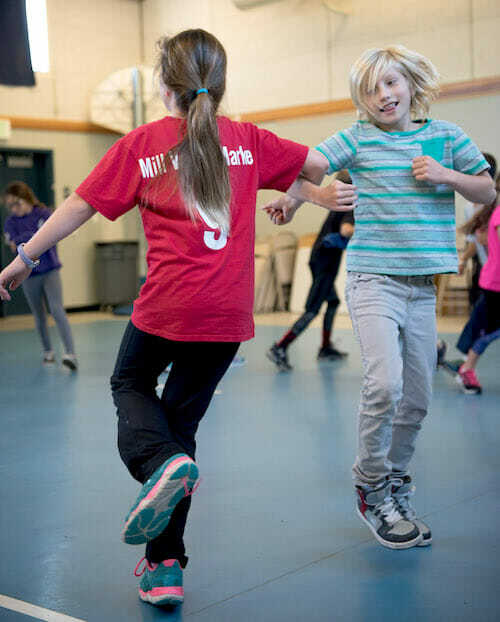 Mill Valley School District provides a grade level standards-based dance unit for Transitional Kindergarten, Kindergarten, 4th and 5th grade students. Kindergarten students experience an inspiring 30-session program that celebrates both "American Traditions" and "Dances Near & Far." In 4th and 5th grades, students kick up their heels with a lively unit entitled "Dance Through the Decades". In addition to learning all sorts of new dance movements, students learn the historical context surrounding the music and dances explored. In addition, there a dance/yoga unit for all 6th, 7th and 8th grade students. These multi-session programs take place during P.E., and give students an opportunity to practice mindfulness as well as learn dance moves to their favorite songs. * Note: The Mill Valley School District manages the academic and administrative business for each school and subject—for both District and Kiddo! funded teachers and programs—including curriculum development, staffing, teacher professional development, class registration, grading, etc.